Uses for baby oil - 20 baby oil uses to save you money! 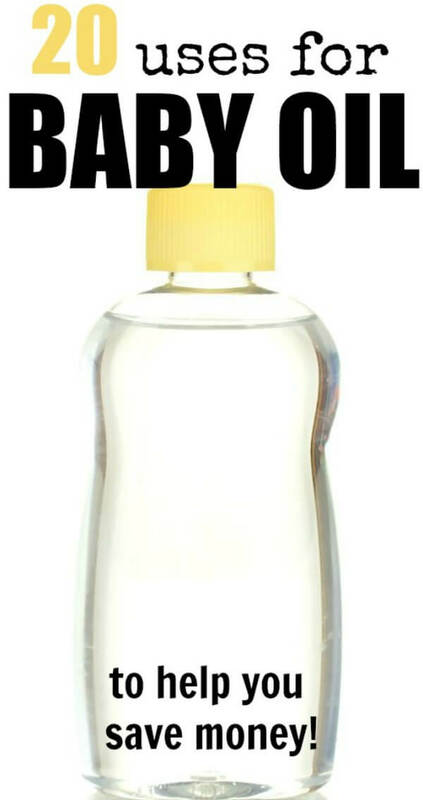 Do you have baby oil sitting in your cupboard, just about as full as when you bought it? Come to think, why did you buy that baby oil? You might be surprised by the variety of uses for baby oil. Here are 20 of the most popular uses. Which ones have you tried before? 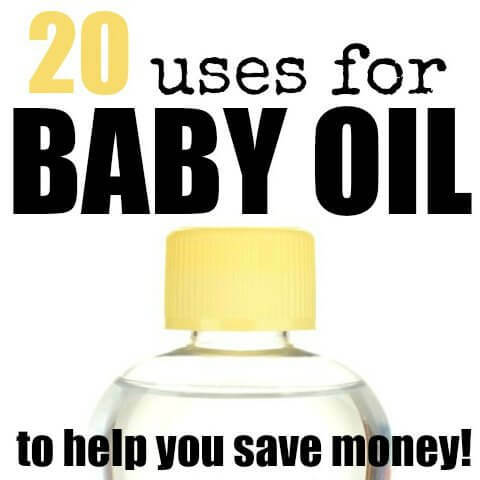 20 Uses for Baby Oil that will save you money! Many of these baby oil uses you will wonder why you didn’t try sooner! You will love saving money! They are just so clever. 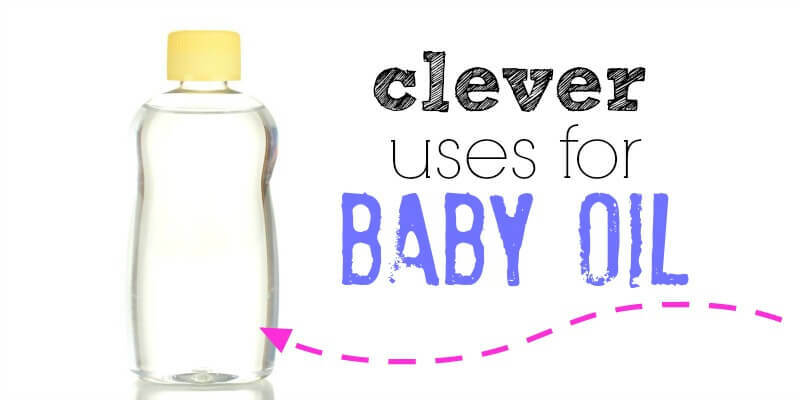 If you have ever wondered, is baby oil good for your skin, here are 20 uses you will love! Just dab a bit of baby oil on a cotton pad and gently wipe off eye make up. Be careful to avoid your eye ball. Have you ever shaved with baby oil? The baby oil will leave your skin silky smooth and helps prevent nicks. The baby oil will also leave your skin soft and moisturized. After a shave, rub some baby oil on your skin every day to prevent red bumps and other irritation. This, too, will moisturize your skin. It also works well for massage oil. Do you kids ever get a temporary tattoo? I know mine love them. Sometimes they last a while and other times, the tattoo is short lived. When you find a temporary tattoo (or part of it) that is just lingering on the skin, use a little baby oil to remove it. This is probably one of my favorite uses for baby oil – pour a little baby oil on a towels and then gently rub the tattoo off. This works quickly and does not irritate the skin at all. I don’t know about you, but I am not exactly what you would call a “neat painter”. I am careful of the floor and furnishings, but for some reason I seem to get it all over myself! You know that soap and water doesn’t exactly get all of the paint off well without a lot of scrubbing. Next time you have dried paint stuck on yourself, try removing it with a bit of baby oil. It works like a charm. 6. Get the Gum Out! By now you have seen a trend. Baby oil does wonders about dealing with sticky situations. The next time one of your kids (or you) gets gum in their hair, try rubbing some baby oil into it. The baby oil should coat the hair around the gum and you should be able to comb it right out. Be sure to wash the hair thoroughly afterward. If you have a stubborn zipper on that favorite sweatshirt, try a little baby oil. Just dab a few drops of baby oil on the zipper parts and the zipping will be so much smoother. A little baby oil can work great at de-clogging ear wax from ears. Just place 4-5 drops of baby oil (warmed is best) in the clogged ear. Let it sit, with head sideways, for a few minutes. Tilt head to the other side and let the oil drain out. You can rinse with warm water afterward to get rid of any straggler bits. If you live in a cold weather climate (or will be traveling to one), try this tip – cover exposed skin with baby oil to add an extra layer of warmth. Let’s say you have a scarf, ear muffs and a beanie, but your eye area and nose are still exposed. Slap some baby oil on the exposed skin. I hear this works like a charm. If you have a chain necklace you love, but it seems permanently tangled up with another, try a little baby oil. Dab some baby oil on the knot or tangle and let it sit a bit. Use a toothpick to work out the tangle. The baby oil should help lubricate the chain to make untangling it easier. During our Spring cleaning, we inevitably clean out of billing files and end up shredding a lot of unneeded documents. Of course, shredding too much at one time often leads to a jam. If your shredder is stuck because it hasn’t been used in a while or you have a jam, dry dripping a few drops of baby oil on the blades. The oil will help coat the blades and let your shredder run smoother than ever. We were fortunate to only have one baby develop cradle cap. This can get really unslightly. Keep cradle cap under control with a little baby oil on baby’s scalp. Just massage in a little bit of baby oil and then wipe off gently. The baby oil will help get rid of all that yucky-ness. Mix a little baby oil into you next bubble bath for extra soft and smooth skin. The warm water and baby oil will make skin so soft. PLEASE be careful anytime you use baby oil in the bath or shower. The footing can get quite slippery so take heed and clean up well afterward so know one else slips and falls because of the bath oils. If you have a squeaky door (or wheel or whatever) and you can’t find the WD-40, try a little baby oil. Just a drop or two usually does the trick. The oil will lubricate the hinge and your squeaks will disappear. 16. Band Aid Stuck on You? We all know the advice – pull it off fast and it won’t hurt as bad. No one said it wouldn’t hurt at all. If you want a more painless way to remove a band aid, try a small amount of baby oil. Put a little oil on the sticky parts of the bandage and let it sit for a minute. The band aid should come off very easily (and painlessly). Are you cleaning your shower doors more often than you’d like? Try applying a little baby oil to your glass doors. The oil will repel soap scum and prevent it from forming in the first place. Win! I have also read that you can use baby oil to help remove sdoap scum, but I have not tried this myself, so I’m not sure. Are you long overdue for a massage? Have your partner massage your tense areas with some baby oil. This works great in place of a massage oil (and is way cheaper). If you have a ring that has shrunk and is now firmly entrenched on your finger, try lubing up your finger with a generous amount of baby oil. This should help ease the ring off of your finger without peeling off a couple of layers of skin. 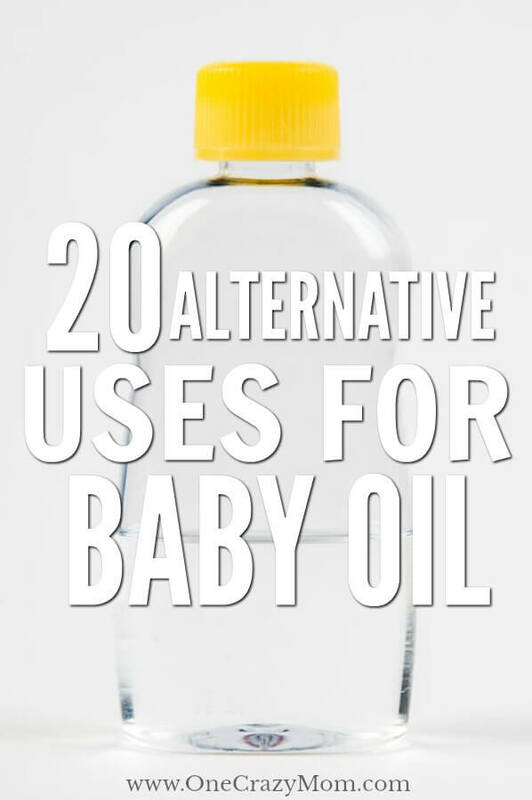 You should have lots of new ideas with these 20 baby oil uses! You might also like to know these 10 Different Uses for Baking Soda and Vinegar Together! Lots of money saving tips! Learn how to make shoe spray for odor. It is simple and easy! This DIY Shoe Deodorizer Spray will take care of any lingering odors in sneakers, cleats and more! Find out the top 20 rubbing alcohol uses. Some of these you may be familiar with and other may be new. My twenty year old stainless steel sink has lost its luster. After cleaning and drying it, I put a few drops of baby oil on a paper towel and give it a good rub. Shine restored, smells great, and the slight bit of oil finish keeps the soap film from building up. I also add a few drops to the vinegar and water solution I use for the vinyl kitchen floor to give it a bit of a shine. But just a tiny bit so that it doesn’t make the floor slippery!